Macsween of Edinburgh won the ‘Morrisons Award for Outstanding Business’ at the IGD Food Industry Awards 2012. The prestigious award recognised Macsween’s important contribution in the food and grocery industry. 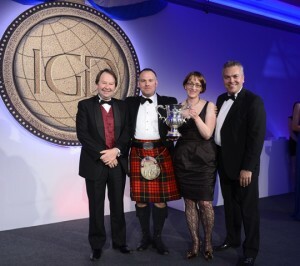 Macsween of Edinburgh collects its Morrisons Award for Outstanding Business at the IGD awards. The judges commended Macsween for being ‘a company with innovation as its lifeblood, which has delivered accelerated, sustainable growth in this challenging economy’. After a demanding judging process, which saw Macsween present to a panel of industry judges last month, the winner was announced at the award dinner held at London’s Lancaster Hotel in front of many of the industry’s big names.